Why is it that some things just make you smile? 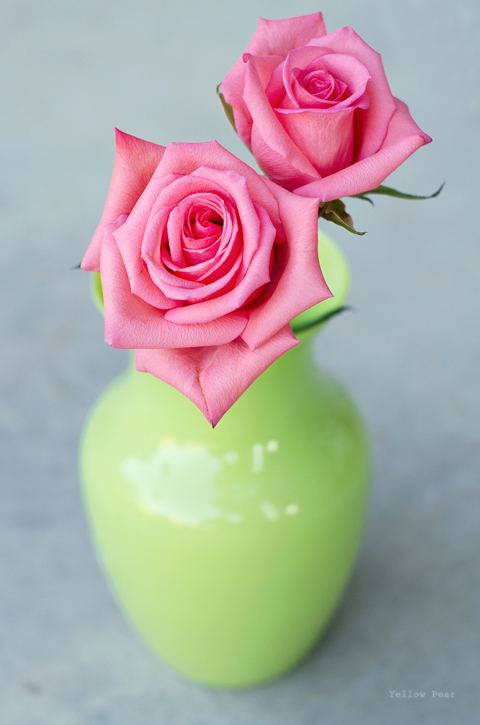 Pink roses in lime green vases sure make me grin. And I could stare at them all day. I had to take a picture before they wilted away forever. Sometimes the beauty around me just takes my breath away. And I think I miss it half the time. Like the sky for instance. How many times have I just rushed through my monotonous days and weeks and months without even looking up and missed something breathtaking? Because it seems the sky is some sort of masterpiece or another every single day. Whether it be big puffy, cotton candy clouds, or wispy curling, cirrus clouds spanning a bright blue sky or dark, ominous storm clouds...every day is different but beautiful. It's amazing. I've been watching it lately. And can't you just smell those pink beauties? Wow! You should print that off as a 20x30 :O) I do love lime green and pink. Reading this was the perfect start to my day. *aaaah* :) You are a right fine writer, Lou. Love the pink and green. Flowers make me sooooo happy. Although flowers are usually considered as symbols of love and affection, pink roses have different and often contrasting meanings depending on where you look.